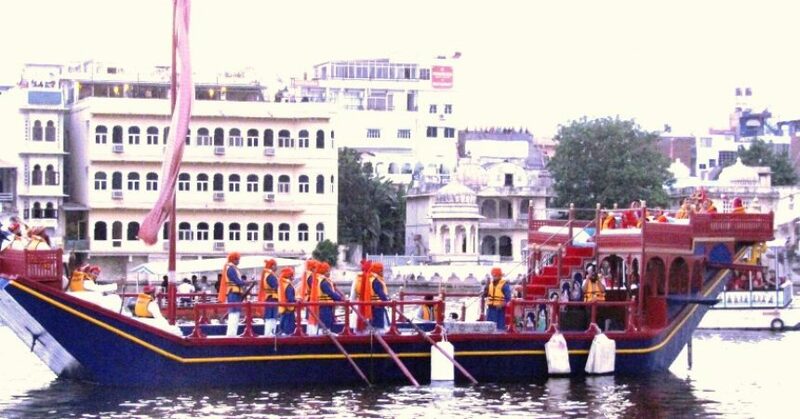 Gangaur Festival or Mewar Festival is the most culturally rich festival which you can witness in Udaipur, if you are a traveller then there is no reason to skip this beautiful fest but if you are a local like me and never thought of visiting the old city to witness this extravaganza then you have definitely missed an exhilarating experience, better late than never, you still have a chance to be a part of this festival as the festival is commencing from today, 08-04-2019 and will last for next three days. 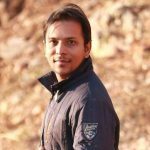 I am an udaipurite right from the birth but it would be very embarrassing and unfortunate for me to say that I had never seen the Gangaur Celebration in Udaipur all this while, as a child no one took me to this fest and as I grew up, I left Udaipur for studies and then got stuck in job outside Udaipur so witnessing this beautiful fest never happened for me, it was in 2017 when I returned back to my hometown Udaipur to finally settle for life, I decided to confront this grand celebration. 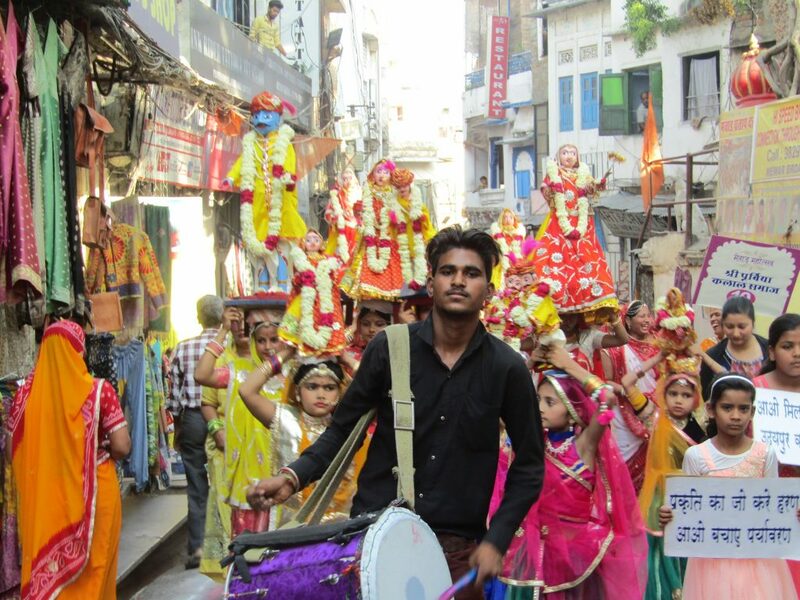 I visited the old city and was completely mesmerized by the atmosphere there, the procession with colourfully dressed women and girls carrying the superbly adorned ‘Gangaur'(‘Shiv-Parvati’ idols) on their head and performing dance in the middle of the Jagdeesh Chowk was a treat to the eye, the ‘Gangaur procession’ feels like an Indian carnival in which you will see community members dressed as Lord Shiva, animals, King on chariots, soldiers, queen, Lord Krishna, Radha etc. (refer video in the end). 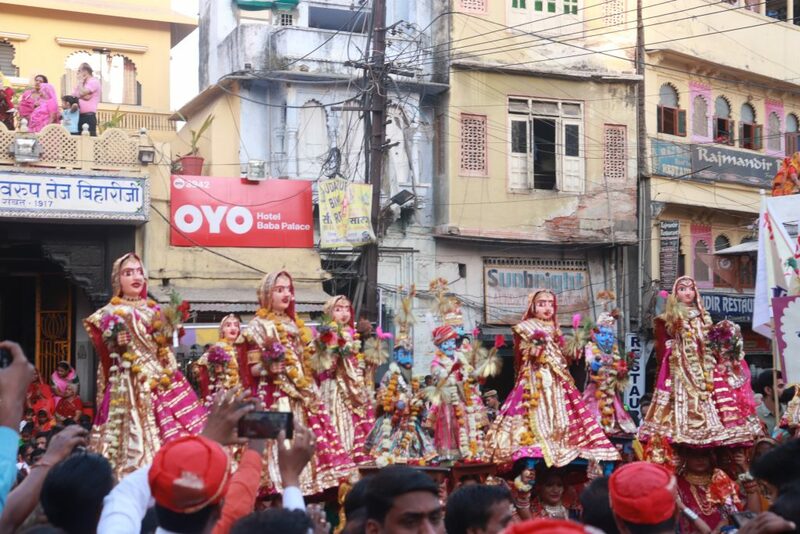 The Gangaur Procession is carried out as a competition in which the local social communities like ‘Bhoi samaj, Salvi samaj etc showcase their respective procession and then a winner with 2 runner ups in announced. The ‘Gair dance’ performed by the dancers from Menar further adds to the fiesta. This dance is based on the warfare combat and performed with two long sticks in which the dancers move in a circle on the tunes of a special war instrument. 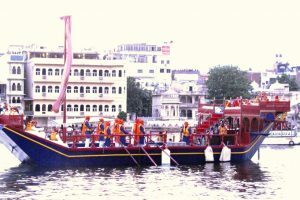 The best part of the festival is when the ‘Royal Procession’ arrives on the pichola ghat, a big blue color boat, the same boat used by actor Hrithik Roshan in Yadein Movie Song ‘Chamakta Noor Hai’ ;), this boat is escorted by several other small boats loaded with royally dressed men and Women playing the Dhol. 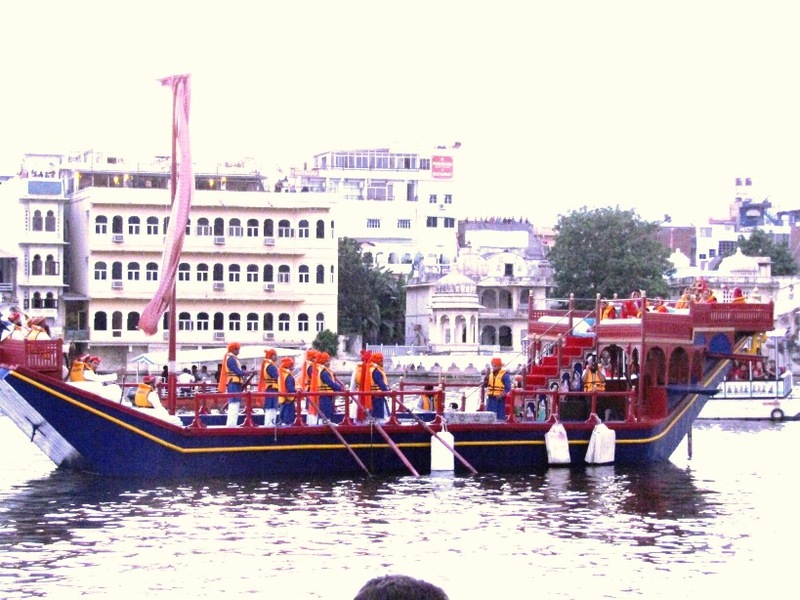 It’s an age old custom to bring the Royal Gangaur to the Gangaur Ghat. 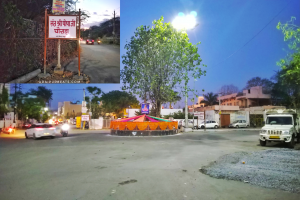 In the night lot of cultural activities and firework happens on the stage errected at the Gangaur Ghat, various competitions are held in which the foreign tourists also take part.I could see tourists from various countries getting so mesmerized with this cultural interaction. 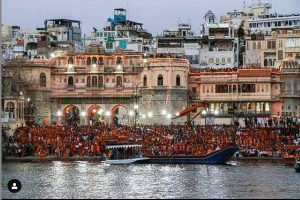 So to cut a long story short, please visit Udaipur Gangaur Festival at least once, and today you would witness the Royal Boat procession too, so be there at around 4:00 pm with your camera. 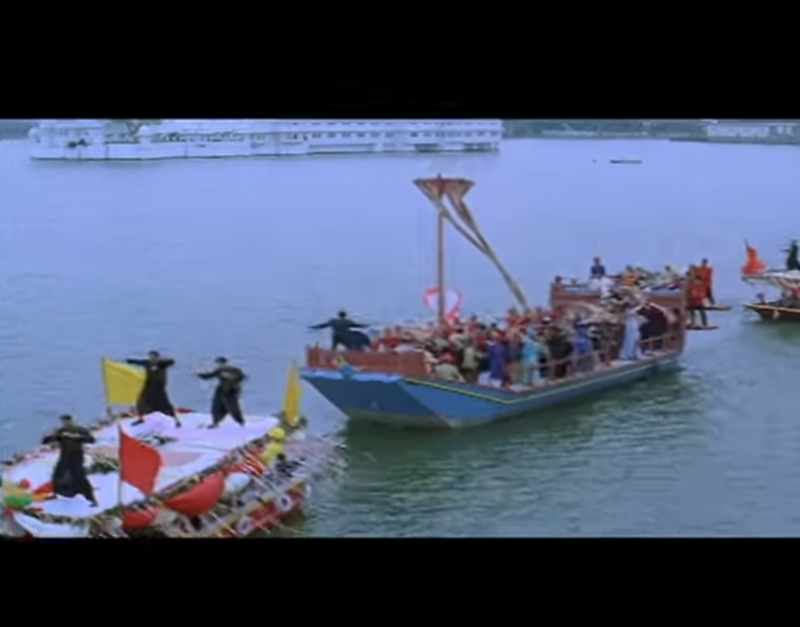 The Blue gangaur boat used in Yadein movie song ‘Chamakta Noor hai’. Watch the video below to see glimpses of this festival which I shot in 2017. 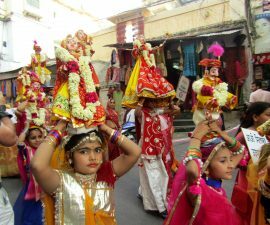 If you wish to know more about the Gangaur Festival and it’s significance read it here.